This easy-to-find mushroom gives brilliant oranges and reds. 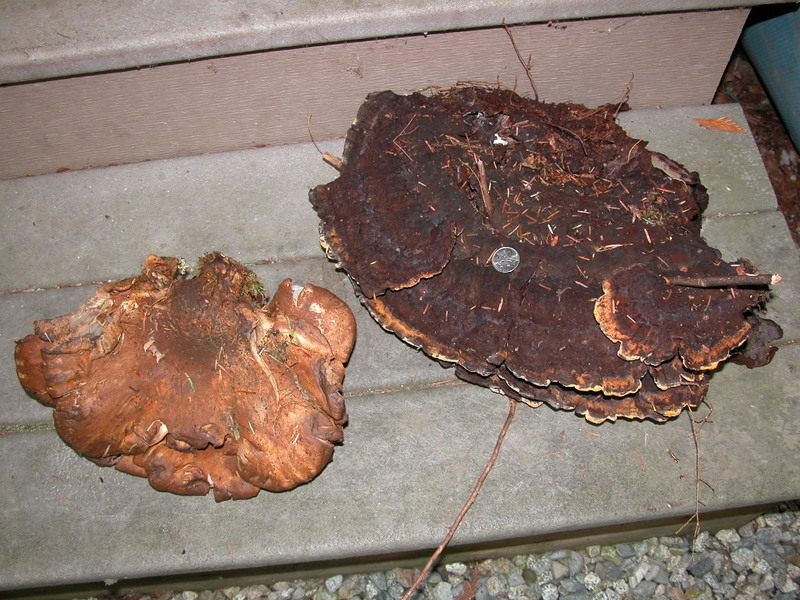 I obtained these huge specimens on the weekend (see the quarter for perspective) at the Sunshine Coast Mushroom Festival here in Pender Harbour. A friend brought in the huge Velvet Pax on the left (Tapinella atrotomentosa) for the ID table. This is in my dyepot at the moment, and I have high hopes for the greens, greys and maybe even mauves that it’s going to give me. Then on our foray with Larry Evans Sunday, I found the biggest Dyer’s Polypore (Phaeolus schweinitzii) I’ve ever seen, at the base of a very, very old Douglas fir. The tree stood no more than eight feet tall, but it stood straight. Woodpeckers and birds had taken their toll, and it was devoid of bark, ready to collapse soon. I saw the remains of several old Phaeolus around its trunk, and peering out from a hollow under a giant old root, this fabulous beauty caught my eye. This lovely one deserves a dyepot of its own. 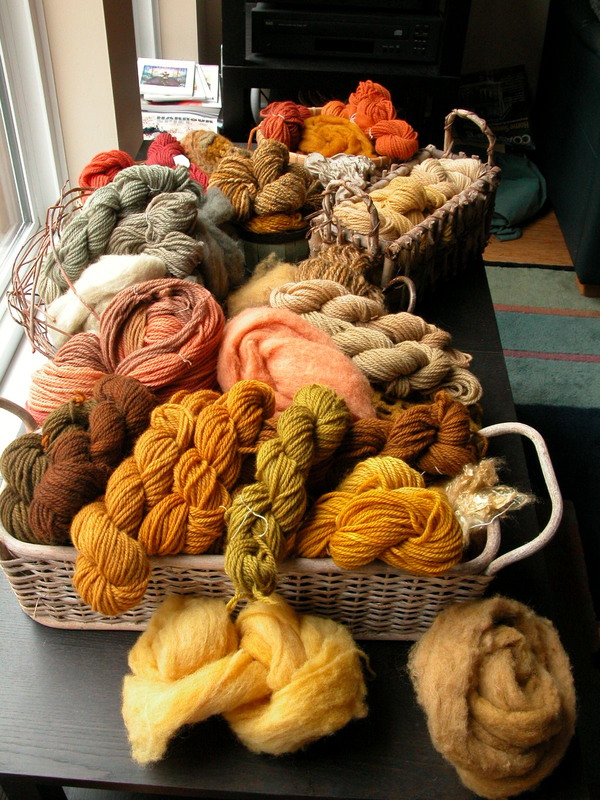 The house is filling up with all manner of mushroom-dyed yarns, rovings, fleece and silk scarves, all in preparation for the annual craft sale at the Dunbar Community Centre in Vancouver on Saturday, November 27. 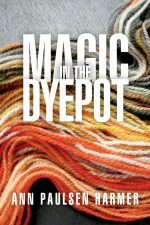 I still have a few dyepots to go, most notably the lobster dyepot (Hypomyces lactifluorum), which I’ve been putting off because most of the lobsters people have given me are starting to get a bit . . . shall we say . . . ripe. 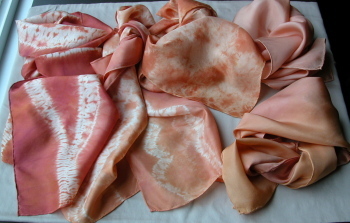 That doesn’t affect the colour, but it probably means I’ll be peeling off the orange layers outside. I’ll have to take advantage of the next dry day to do so. Our own lobster patches – those that survived the logging behind us – haven’t produced anything this year, sadly enough. I like to think the mushrooms are protesting the fact that their space is within site of the clearcut areas. I have no doubt they’ll be rested and ready to resume normal mushroom behaviour next year. 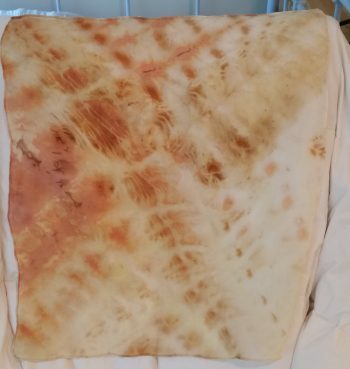 I found lobster mushrooms (Hypomyces lactifluorum) in such great abundance this year that even after setting aside enough parings to get good colour for the dyeing workshop, I had enough left for a strong dyepot of my own. 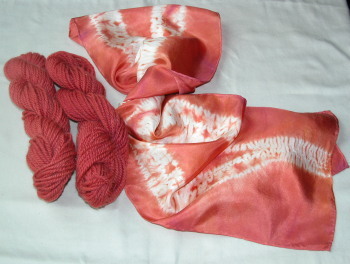 This is the brilliant red that resulted from my first dyebath, while the images below show the exhausts that came out of that same pot – all the skeins, as well as all the scarves. A hike up Pender Hill yesterday resulted in yet another bag of lobsters, totally unexpected, and even though they’ve gone mushy, I hope to get another dyebath of equal strength. At last I’ve had a chance to take some photos of the finished skeins showing the lovely colours we got from the dyepots at our October 16 workshop. I usually leave this particular dyepot to the end of the workshop because the colours are so beautiful and the changes so dramatic when you shift the pH by putting the skeins in different afterbaths – in this case, the skein on the left was put into a pH3 solution (water and a bit of vinegar), while the one on the right was soaked in a pH11 solution (water and washing soda). 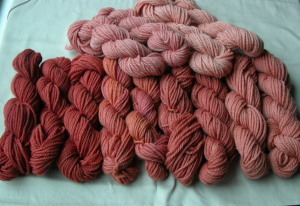 The skein in the middle was left as it was right out of the dyepot. We had an abundance of lobster mushrooms in this area this year. As you can imagine from looking at the image, they aren’t hard to spot when they’re emerging from the moss or the forest duff. I’m just now getting ready to fire up my own dyepots with the lobster parings I’ve been gathering over the past month or two.